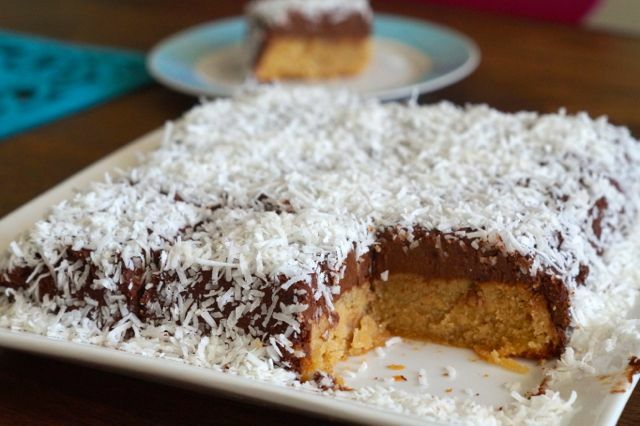 Paleo Lamington Cake | Paleo Australia Day Recipes. 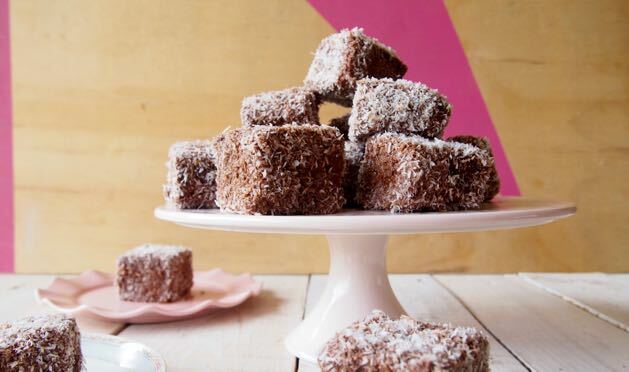 Our Australia Day celebrations wouldn’t be complete without a lamington! So here’s our version! A very delicious, very easy paleo lamington cake! Whiz this up and trust us, it might even be better than the original! Happy Australia Day all! BUT WAIT! We created a new version! Get the brand new and way better healthy paleo lamington recipe HERE! You know you want it! Check it out below (DROOOOL!). After more Australia Day recipes? Check out our paleo roast lamb in the BBQ and our paleo pavlova! Pre-heat oven to 180 degrees celsius + line a 20cm x 20cm square cake tin with baking paper. In a blender, or mix master (we use our Vitamix), whiz the eggs, coconut oil + vanilla until combined. In a bowl mix the coconut flour, coconut sugar + baking powder. Add the egg mixture + stir well until combined. The mixture is very thick, don't be alarmed! Allow the cake to cool completely in the tin until turning out. Once the cake has cooled completely cover with delish frosting + sprinkle with desired amount of shredded coconut (we say the more the merrier!). In a blender or food processor (we use our Vitamix) whiz the cashews + raw cacao powder until a fine meal forms. Add the coconut oil, coconut cream + Natvia + whiz again until smooth. Spread on top of the cooled cake + sprinkle with shredded coconut.